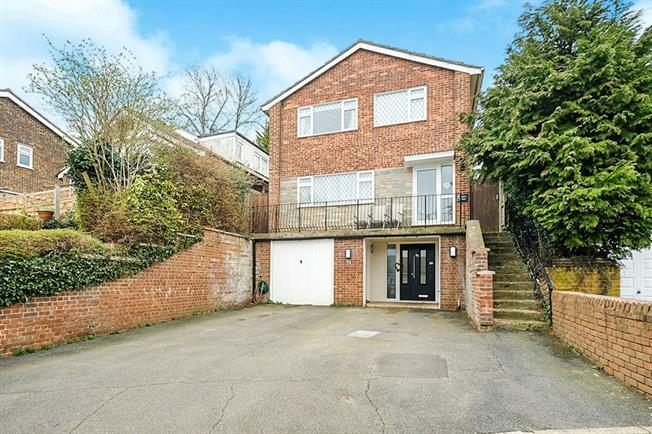 4 Bedroom Detached House For Sale in Westerham for Guide Price £500,000. This well presented four bedroom detached family home enjoys views to the front of the house and features a balcony to the front of the house to enjoy these views, accommodation comprises of a modern fitted kitchen, good size lounge/diner, cloakroom, family bathroom and four bedrooms, the rear garden has a decked patio area, astroturf area and further good size lawn. There is a garage and driveway to front providing off street parking for a number of cars. Via modern composite front door, radiator, stairs leading to first floor. Door opening onto balcony, doors to cloakroom, kitchen and lounge/diner, radiator, under stairs cupboard, stairs leading to second floor. Opaque double glazed window to side, low level wc, hand wash basin with cupboard under, chrome heated towel rail. Space for patio furniture, provides space to enjoy the views to the front, wrought iron balustrade. Double glazed window to rear, double glazed door to side, fitted with a range of wall and base units with work surfaces over, built in 'Bosch' electric oven, gas hob with extractor hood over, space for washing machine, tumble dryer and dishwasher, space for American style fridge/freezer, one and a half bowl stainless steel sink unit with mixer tap, part tiled walls. Built in cupboard, doors to bedrooms and bathroom. Double glazed opaque window to rear, white suite comprising panel enclosed bath with hand held shower attachment and rain water shower, low level flush wc with storage surround and inset hand wash basin, chrome towel rail. Double glazed leaded light window to front, built-in mirror fronted wardrobes, radiator. Double glazed window to rear, built-in mirror fronted wardrobe, radiator. Double glazed leaded light window to front, radiator, built-in cupboard. Rear garden with decked patio area with space for garden furniture, astro turf to side of decking, steps leading to good size lawn area bordered with trees and shrubs. Driveway providing off street parking for a number of cars, security lighting in driveway, steps at side of house leading to balcony across the front of the house.